· Paycheck stubs— Once you’ve reconciled these stubs with your annual W-2, you no longer need them. · Checkbook ledgers (if you use them)— Many people today keep ledgers online using an accounting software. If you do the old-fashioned handwritten check ledger, you won’t need it longer than a year. · Insurance statements and records— Once you receive a current policy renewal or statement, the old one becomes obsolete. · Investment account statements–In general, store these for at least one year. Include your monthly statements as well as any trade confirmations. · Undisputed medical bills and receipts— Keep these documents if you’re haggling with insurance or have a personal injury case in the works, keep these as evidence. Otherwise, you can get rid of them after a year. · All tax-related receipts —These documents justify your tax deductions if the IRS wants proof of them. 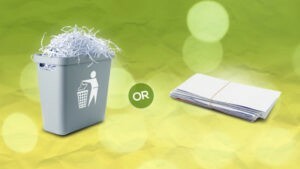 · Cancelled checks for tax, business, mortgage and home improvement purposes —Some people like to save their cancelled checks, but if you want to minimize, go through these checks once a year and shred any that are irrelevant while keeping those that relate to your tax, business, mortgage, or home improvements. · Bank statements– Keep them for at least one year, either in printed form or saved in electronic form. They can be useful when identifying potential fraud, identity theft or other anomalies with your account. As with all financial or legal documents that have personally identifiable information, always shred paper copies before discarding. · Disability records and unemployment income stubs— It’s a good idea to keep paperwork related to income you receive directly from the government. · Personal identification documents —These include birth certificates, Social Security cards, current and outdated passports, etc. · Legal documents —These include marriage and divorce certificates, lawsuit settlements, etc. · Vehicle titles and/or related loan documentation–Hold these for at least three years from the date the transaction is finalized. Many people keep them for 10 years or longer, however, because they can be helpful even long after the transaction is done if there are any questions. · Annual investment and retirement account statements–Your quarterly statements should be held until the annual statement arrives. At that point, cross-check the quarterly statements with the annual one. If everything matches, you can shred the quarter statements. Keep the annual records until the account is closed. · Education records— These include high school and college transcripts, as well as diplomas and degrees. · All relevant financial planning records— These documents include wills, living wills, trust documents, pension plan documents, power of attorney designation, medical and burial information, etc. Keeping up with documentation can be a challenge, even for the most diligent families, and even with the most organized systems. For financial planning purposes, we can help you set up a personalized legal document plan to help you stay on top of your planning needs. Contact us today at (913) 871-2188 for more information.